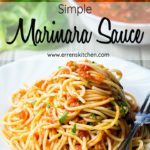 Save time with this Quick & Easy Marinara Sauce that's tasty and great with pasta, meat or shellfish! 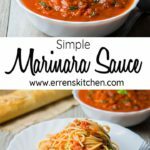 Save time with this recipe for Simple Marinara Sauce – An easy and delicious tomato basil sauce that’s great with pasta, meat or shellfish! I’ve been cooking Italian food for as long as I could remember. My Mom used to wake my sister and me up early on Sunday mornings to help chop garlic and roll meatballs. It’s a right of passage in every Italian-American household. That said, Italian food doesn’t have to be something you get up early for. It can be quick and easy with loads of authentic, Italian flavor. 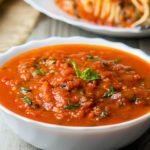 This Italian marinara sauce is super simple to make and tastes so much better than store bought. It’s perfect for busy weeknights that leave you pressed for time. All you need is some chopped garlic, canned tomatoes, basil, and seasoning. It’s that easy! 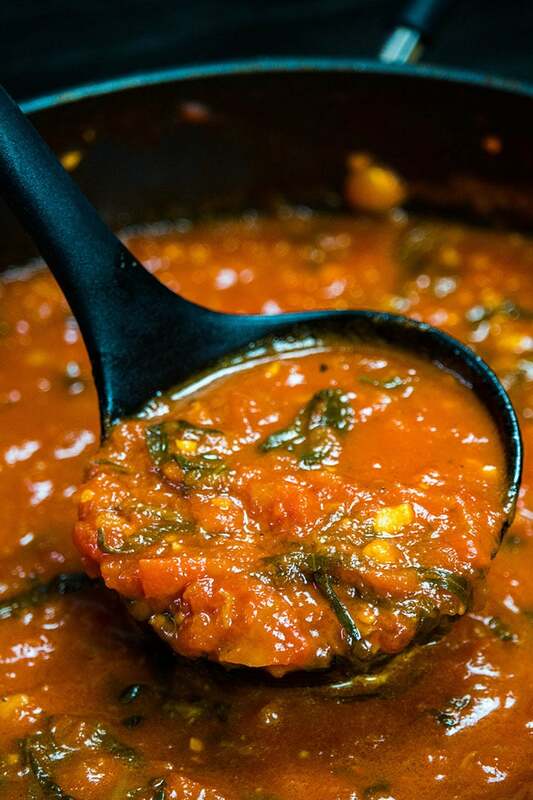 Marinara Sauce is made with simple ingredients: Tomatoes, garlic, fresh basil, and seasoning. A lot of Marinara Sauce recipes include onions. I decided to use just garlic, fresh basil and seasoning to keep it simple and quick to prepare. This fantastic, flavorful sauce can be used for anything from a quick spaghetti sauce to sauce for pizza or a seafood marinara. 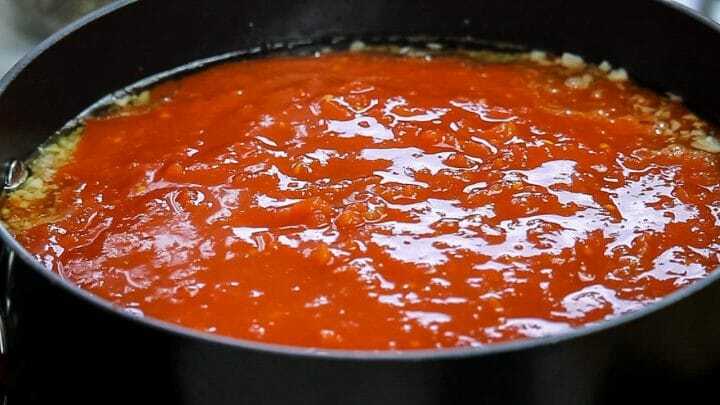 Make a rich authentic Italian Sauce with just 5 simple ingredients. 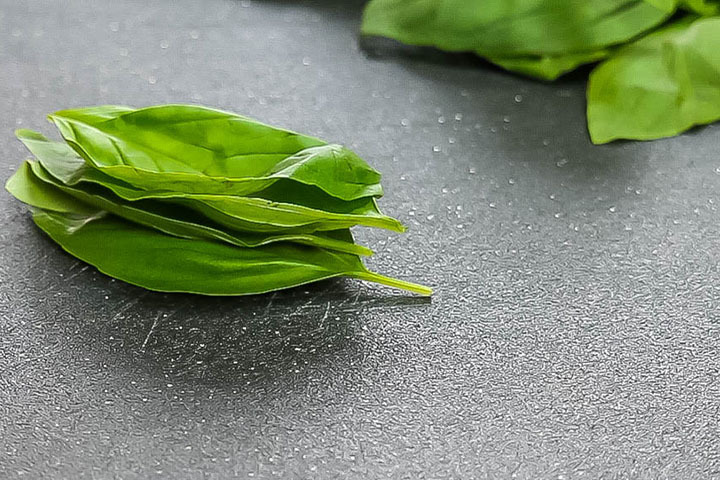 The sweet basil adds sweetness without the addition of sugar. Using just one aromatic adds depth of flavor while keeping it quick to prepare. What is the difference between Marinara Sauce and Tomato Sauce? 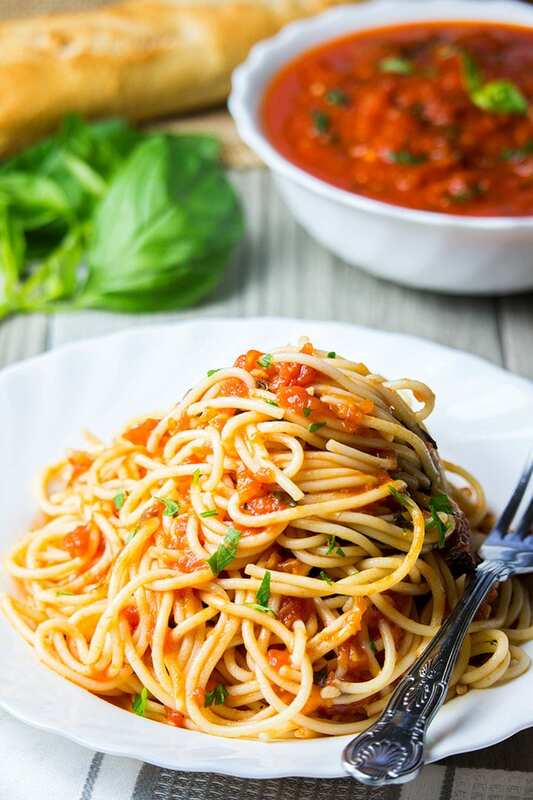 Marinara sauce is a quick and simple tomato based sauce with very few ingredients (usually garlic and herbs) while tomato sauce, like my Easy Homemade Tomato Sauce, is more complex with many elements and longer cooking time. What Tomatoes are Used to Make Marinara Sauce? Whole peeled tomatoes are best for making tomato sauce. This is due to the fact that they break down easily when cooked as they are canned fully intact, with less surface area exposed to the chemicals added to canned goods to keep them from breaking down too much. To use them for the sauce, you can crush them with your hands, puree them in a food processor or mash them with a potato masher. 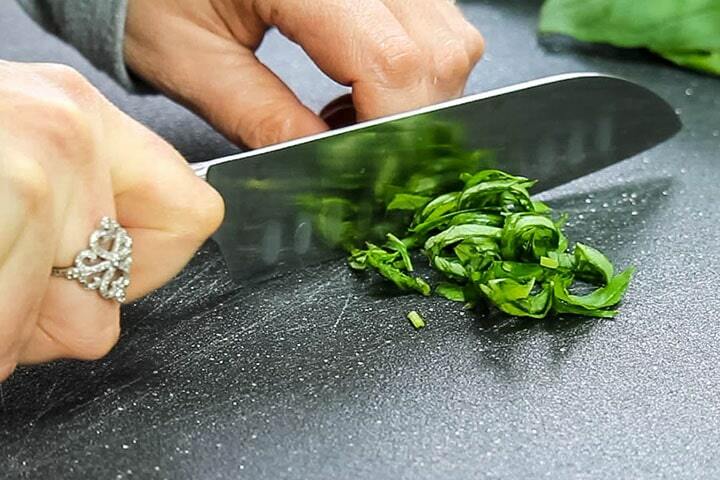 Slice or chop the basil. 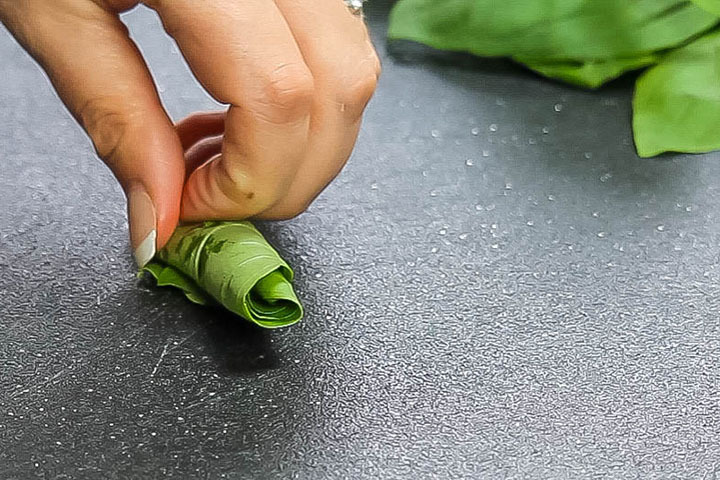 To do this easily, stack the basil leaves on top of each other. Roll them into a cigar shape. Set the prepared basil aside and start on the sauce. Heat the olive oil in a large saucepan and saute the garlic for about a minute until lightly browned (being careful not to let it get too dark). Add the fresh basil. Mix to combine. Season with salt and pepper. Cook, uncovered, over medium heat for 10-15 minutes. Taste for seasoning before serving. This Quick & Easy Marinara Pasta Sauce can easily be frozen and saved for another day. I often make it in huge batches and freeze it to use in all different ways. When cooking the garlic, cook until it just starts to brown before adding the tomatoes. 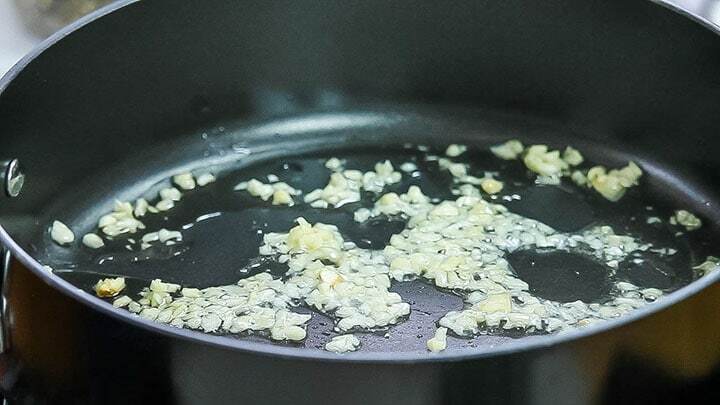 Garlic burns easily and will become bitter when overcooked. 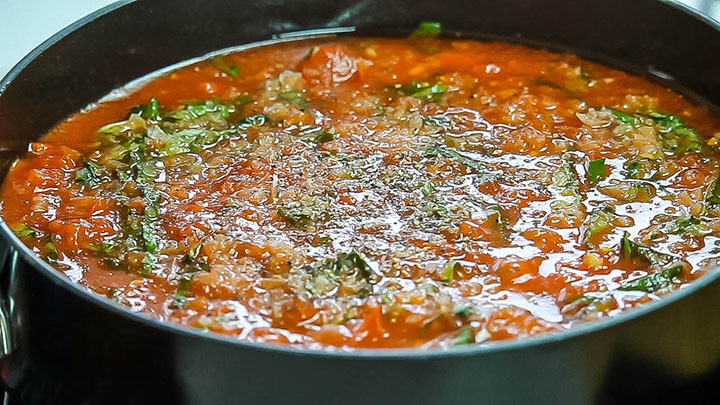 The basil should add enough sweetness to cut the acidity of the tomatoes, but if you feel it needs more sweetness, add sugar a half teaspoon at a time until it has the desired sweetness. Seasoning is key to a quick cook sauce. Season well with salt. Taste between small additions, allow to dissolve and add until it’s perfectly seasoned. For an added kick, add a pinch of red pepper flakes. Can Marinara Sauce be Frozen? The marinara sauce freezes really well. Just add it to an airtight, freezer safe container and freeze for up to three months. How long can marinara Sauce be stored in the refrigerator? Stored properly in an airtight container, the marinara sauce can be stored in the refrigerator for up to three days. Heat the olive oil in a large saucepan and saute the garlic for about a minute until lightly browned (being careful not to let it get too dark). Add the tomatoes & basil, season with salt and pepper and cook, uncovered, over medium heat for about 10-15 minutes. Seasoning is key to a quick cook sauce. Season well with salt. Taste between small additions, allow to dissolve and add until it's perfectly seasoned. Loved this sauce over a big bowl of pasta. Perfection! My family would LOVE this!! It sounds fantastic!! This look beyond delicious! I love how easy to make this and it’s incredibly delicious, absolutely a must try! Thank you, Melanie, I’m glad you think so! It is perfect for the busy evening’s! Having a good sauce recipe in your arsenal is essential. A good sauce is such an essential base to all dishes. Love that yours is so easy to make! This is my favorite pasta sauce ever!! I make it all the time! It is good isn’t it! This is not only quick ans easy, but it’s really delicious too! Thank you for sharing! Made this with some very ripe tomatoes I had instead of canned tomatoes and it was terrific!